MHI :: PASADENA :: STAFF :: Francisco Navarro, M.D. Dr. Navarro is a board certified psychiatrist and founder of Mind Health Institute, Pasadena. He has been recognized for excellence in leadership, clinical care, and dedication to service. 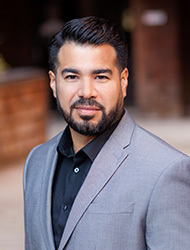 Dr. Navarro completed his undergraduate degree in Biological Psychology at UC Los Angeles. He worked as a public health educator in the South Bay serving over 800 middle school children for two years prior to pursuing medical training. He received his medical degree from UC Irvine College of Medicine and graduated with Honors in Service as an inductee into the Gold Humanistic Honor Society. Dr. Navarro then returned to UCLA where he trained in the Adult Psychiatry Residency Program at the prestigious UCLA Neuropsychiatric Institute (now named the Semel Institute for Neuroscience & Human Behavior). He continued his training at UCLA's Child and Adolescent Fellowship where he was selected as Chief Fellow during his last year of training. As Chief Fellow, he took on a leadership role and participated in multiple advisory boards. He enjoys working closely with the community to decrease the stigma of mental illness via grassroot methods and collaborations. He was program director and developed "Greeting Life's Opportunities" (GLO) Program which served to educate parents' coping skills of daily life stressors in the South Bay. Dr. Navarro is currently on faculty at UCLA and provides clinical supervision to Child and Adolescent Psychiatry In-training clinicians. He is an active member of American Psychiatric Association (APA) and the American Academy of Child and Adolescent Psychiatrists (AACAP). He has held positions as an executive board in the Southern California Society of Child and Adolescent Psychiatry.